Tape around the front fork of my bicycle. Y’know what’s on my mind tonight? Tape. That sticky stuff that’s really useful for holding other stuff down temporarily. Yeah, I know a lot of people think duct (or duck as the case may be) tape is a permanent solution but it’s only permanent for a short period of time. A little too short a period in the case of the roll of duct tape that I have now. I bought it at the hardware store last year. I think the brand is Blue Dolphin and it’s the worst duct tape I’ve ever bought. It just doesn’t stick well enough. It comes off whatever I stick it onto in a relatively short period of time. I’ve still been using it though because I’m too cheap to buy another roll of another brand. I just expect it to fail and have to be replaced fairly quickly. It’s also a reminder that duct tape is in no way a permanent solution. The tape that I use the most is white paper tape. It’s an inch wide and the paper core is about three inches across. About the size of a slip-on bracelet. I use it for taping paper to my drawing table if I need the paper to stay in place as I draw on it. White paper tape is sort of like masking tape but with less glue on it. Masking tape could rip the surface of the paper as you attempt to remove it but white paper tape won’t. They make a tape called drafting tape that has even less stickiness to it and is specifically made to be easily removable but I haven’t used any of that since the 1990s. I find the white paper tape a little bit more versatile. I also use the white paper tape to keep my large sheets of paper in place on my drawing board when it’s on my easel. It’s the same task as the tape on my drawing table except the paper is upright rather than laying flat. I only mention this because the white paper tape almost always fails at this task as time goes by. I tape a large 22×30 inch piece of paper on the board, draw on it over a period of time, and then watch as the tape slowly comes off the drawing board. It takes a day or two but it always happens. It’s not the end of the world so I just put up with it. Another strange thing about the white paper tape is that it sticks to itself too much in the middle of the roll. Since I only go through a role every few years it may have to do with age but I’m not sure. As I get to the middle of the role the tape gets harder to peel, rips, and leaves residue on itself. Then it clears up. I’ve noticed this pattern with other rolls over the years. I have no idea why it does it but I work through it. I used to have a tape dispenser that hooked onto the side of my drawing table that could hold four or five rolls of tape. I had that thing racked with tape, white paper tape, drafting tape, Scotch tape, removable tape, and acid free framer’s tape. There was a serrated metal strip on the front of the dispenser that cut the tape. The problem was that I cut my hand on strip too many times. I’d bump into it. Couple that with the fact that I really didn’t need such a large variety of tape at my fingertips I eventually retired that dispenser. Cut to the present day and I was actually wondering recently if I kept that dispenser. I still have a one inch roll of Scotch Magic Tape left from the late 1990s. It’s amazing that the tape is still good. That’s the Scotch tape in the green package and it’s made to last a long time. I bought some mid-1960s comics books at a garage sale in the early 1980s and in which someone had reinforced the spines with that magic tape. All these years later that tape is still good. Most other tape would have turned brittle and yellow by now. I couldn’t find my old tape dispenser but a week later a friend mentioned to me that he was getting rid of one and asked if I wanted it. I said sure. Turned out it was a smaller dispenser than my old one (one or two rolls rather than four or five) but that didn’t matter. I only wanted it for the one roll of tape so I was good to go. It’s amazing how much more I use that tape now that it’s on a dispenser. The white paper tape is easy enough to use by hand but not so much the Scotch tape. Finding the end of the tape and then peeling it off itself is a pain with the Scotch tape. On the dispenser it’s just pull and cut on the serrated edge. Another type of tape that I use a lot of is plastic electrical tape. I use that for repairing stuff. Years ago I bought some small rolls of half inch electrical tape in a variety of colors. Red, green, blue, yellow, and white. 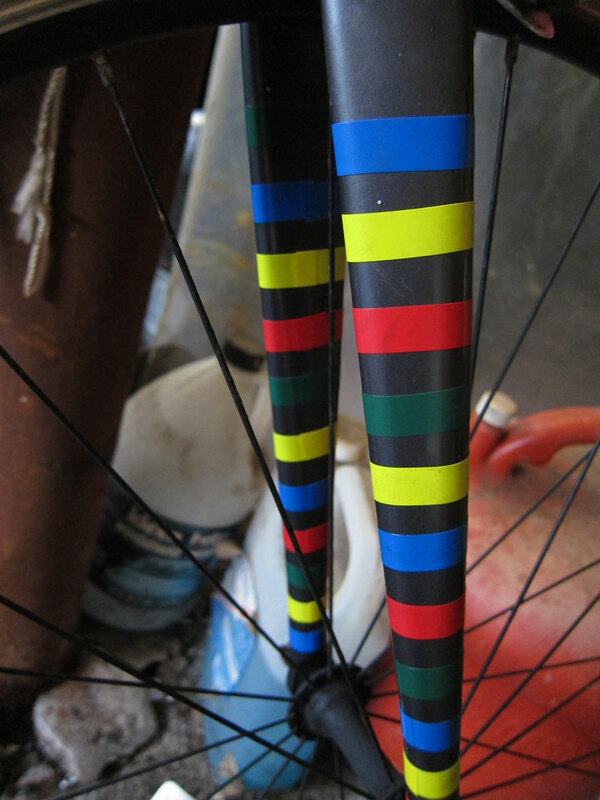 I originally used it to make rings of decorative color on my bike. I don’t know why I did that but it came to me one day to do it so I did. Ever since then I’ve found other uses for the tape and even bought more of it. I use it mostly for repairing small things like the handles on a laundry basket that broke. I taped them back on. I used to use removable tape all the time when making my photo collages. Digital photography changed that. Removable tape is a low-tack clear tape that can hold a piece of paper in place for a brief time and then be removed easily and leave no residue behind. When I used to compose my photo collages by hand I’d move the pieces of photos around, tape them down, and then move them again. It was a process that took a while since I was cutting up and using real photos to compose in real time. There was a lot of movement to it so the tape was needed to keep things in place. Then in the early 2000s I went digital with my photography and could compose the photos on screen in Photoshop. No need for removable tape in Photoshop. So my need for it went away. Well there you go. That’s the mundane world of my relationship to tape. How the heck did this idea pop into my head?